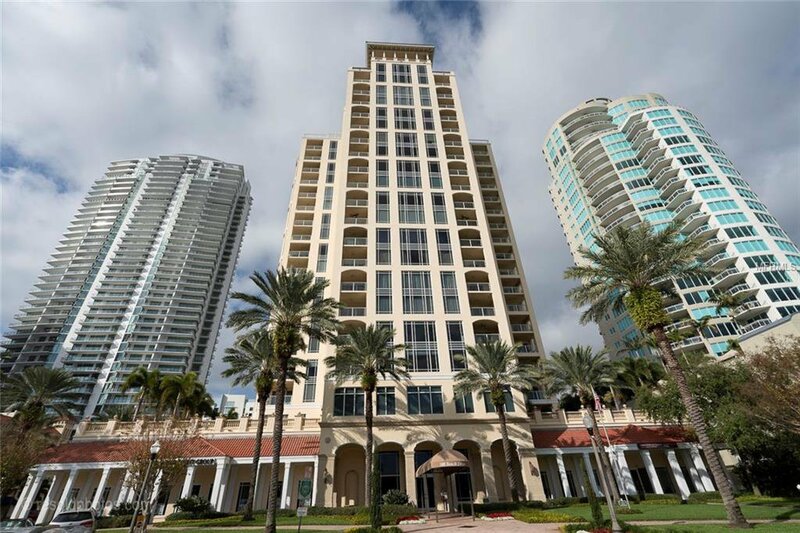 This gorgeous condo at the Florencia building on Beach Drive offers spectacular views of downtown St. Petersburg & Tampa Bay with modern updates & open concept living. This three bedroom, three bath 2500SF condo feels luxurious as you enter into a rotunda, splitting the floor plan. Down the hall is a huge Great room w/crown molding, dark hardwoods, and unbelievable water views. The renovated kitchen is open concept to maximize entertaining spaces & water views, & includes stainless Kenmore Elite appliances, island, wine bar, granite counter tops, modern pendant lighting, custom tile backsplash, & walk in pantry. The living room features a balcony large enough for outside dining, with waterfront NE views towards the Vinoy, Pier, Yacht Basin, & Tampa Bay. Wake up in your master bedroom with direct views of the sunrise. The bedroom features a huge walk in closet & ensuite master bath w/Garden Tub, shower stall & dual vanities. Down the hall, a full hall bath across from a guest bedroom w/high ceilings & large closet. The 3rd bedroom features beautiful views of downtown through plantation shutters. A full ensuite bathroom, linen & full walk in closet make this bedroom a comfortable space for guests. Condo also features a full size laundry room with washer and dryer, hurricane shutters, a separate storage space on 2nd floor, & two parking spaces. The Florencia has just undergone a dramatic restoration & includes a wonderful pool, gym, & other recreational amenities. Don't miss your chance at downtown living! Listing courtesy of SOUTHERN ROOTS REALTY. Selling Office: COASTAL PROPERTIES GROUP.